Karina's Kreations: Stampin'Up Crafting Forever Sneak Peak! 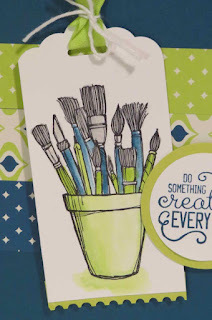 Stampin'Up Crafting Forever Sneak Peak! Isn't this a sweet card? I was using up paper scraps from Eastern Palace Specialty Designer Series Paper and loved how all these designs coordinated together. My strips are 1" x 4-1/4". I stamped the image from the new Crafting Forever stamp set (which is available June 1) and colored it with an aqua painter, Lemon Lime twist, Dapper Denim and Smoky Slate ink. 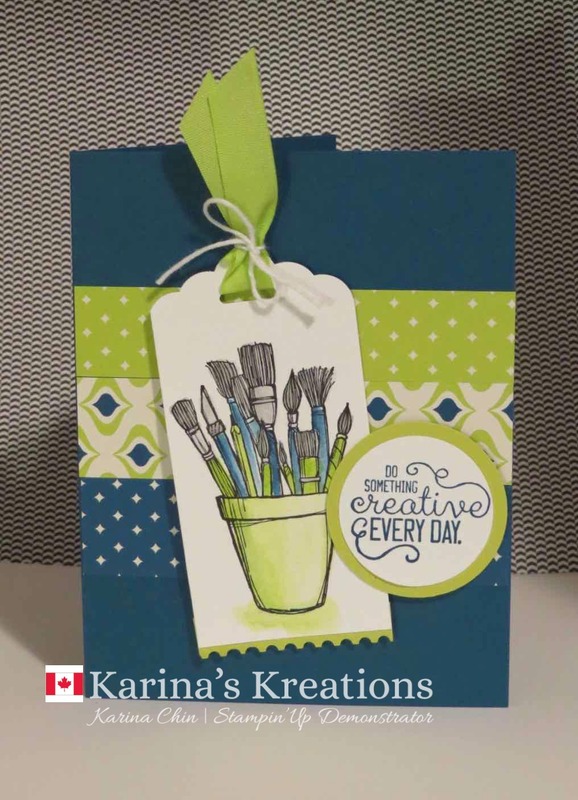 I used four punches on my card, Scalloped Tag Topper, Ticket Tear Border, 1-1/2" Circle, 1-3/4"Circle. Notice the new Lemon Lime Twist ribbon. This style of ribbon will come in all of the 5 in-Colors.